CU racing form being held in hand of white man, pencil being used to circle Shem (#9). LSs crowd gathering at Suffolk Downs racetrack in Boston, Massachusetts, horses coming out of paddock. TLS jockeys walking horses past camera on track. High angle LS crowds gathering in spectator stands. 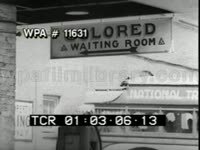 MS white men standing in line to place bets at betting windows; many men wear straw boater hats. MS African-American man wearing light-colored suit, white fedora hat, rounded glasses while consulting racing form or betting sheet, crowd of equally well-dressed young white people standing around him as though reviewing his choice. MSs well-dressed (most seem wealthy, well-off, well-to-do) white men & women reviewing racing forms. Sideview MS white male journalists, sports reporters working, typing, viewing track through binoculars from pressbox (press box). Rear view MS white man wearing dark-colored suit, straw boater hat, watching racing horses with his hands on his knees. MS Shem the race horse, #9. High angle LS/TLSs crowd gathering in stands. Rear view TLS white men in suits watching horse race from platform. Rear view MS hunched old white man in silhouette watching passing race horses from doorway. MS race horse, hand of white male trainer patting neck. Family Life - Candid view of well-to-do family getting together on an important day. Great look at late1920's/early 1930's era clothing. United States Nice GV pan of stately home in up-scale residential neighborhood on a sunny day. MS pre-teen boy sanding in yard wearing suit jacket w/handkerchief in pocket, knickers and argyle socks, looks like an important day for him, several girls w/bobbed hair and cute knee-length dresses (grade school, teen, young adult) enter the frame and shake hands w/the boy, girls hug each other. GV young woman in flapper dress standing on lawn, once again the whole gang joins her hugging and shaking hands, two grade school boys are included in this shot. MS teen aged girl in yard, she puts her hands to her mouth as if yelling or calling, she walks toward camera w/a smile on her face. MS grade school aged boy standing in yard wearing sweater vest, knickers and striped socks. Brief GV of young woman standing in yard. MS same pre-teen boy w/the argyle socks. GV/MS man in suit posing w/the boys. GV young woman in yard, a house is seen in the background. Nice GV pan as children greet an elderly woman (Grandma) walking across the yard, the kids shower her w/hand shakes, hugs & kisses. GV grandma in the yard walking in front of lush landscape foliage. Brief MS grandma walking toward camera. Rear GV elderly man in fedora hat walking away from camera. Three Sisters Islands - Candid look at family visiting Niagara Falls in the late 1920's/early 1930's. Good source for fashion of this era. Niagara Falls MS sign reading "Three Sister Islands" with arrow pointing to the left. TLS family posing w/scenic river view behind them. MS fast moving water, pan up to wide LS choppy river water. Rear GV of people walking onto bridge. Wide LS people standing on boulder overhang of the Niagara River. GV/LS pan rapids & cascades of the Niagara River. Nice TLS tourists walking over pedestrian bridge, cute grade school girl in short sundress looks at the camera and smiles. POV following tourists over foot bridge. Low angle LS looking up at airplane flying overhead. Nice GVs of woman and her three children sitting on boulders w/cascading fall behind them. Wide LS pan rapids of the Niagara River, tourists are gatherer along river bank. LS cascades. Nice CU face of woman w/great 1920's era hairstyle w, a tight curl resting on her forehead. CU grade school aged boy seated on rocks waving. ECU young girl's face, pan to grade school aged girl. Nice MS man in fedora & bowtie posing in front of the raging river, he takes off his hat and takes a seat on the rocks w/his children. MSs man seated on rocks w/his children in front of the Niagara River. Nice MS of man & woman posing on rocks w/their children in front of the river. MS man in Panama hat & striped bowtie seated on rocks w/children. Wide LS/GV cascades of Niagara River. MS "Warning" sign telling visitors that defacing the Three Sister Bridge is a Misdemeanor. Large Estate - Good source for summer fashion circa late 1920's/early 1930's. United States LS pans of large residential yard bordered by well established foliage. Great TLS young man w/two young women existing large estate/home and walking toward camera, all are dressed for summer weather, women wear matching knee-length dresses and Cloche hats (flappers) while the man wears a light colored suit w/Panama hat. CU young man in the Panama hat. CU pretty young woman shyly looking at camera. LS pan exterior of the estate. MS as smiling pre-teen aged boy opens a wrought iron gate and walks toward camera, front entrance to house is seen in the background. Brief MS of teen aged girl wearing a Cloche hat, she looks surprised that she is being filmed. Garden Party BBQ United States MS two men chatting. LS pan of people gathered outside for a summer party. GV men on the lawn socializing. GV barbeque pit in the ground, smoke is rising, people are gathered around. MS man in bowtie raising his glass of spirits for the camera. Several GV/MS/LS people socializing on the lawn at the picnic party, many seem amused that they are being filmed, many look tipsy from the alcohol, all seem to be having a good time. MSs man and woman hamming it up for the camera, the man looks drunk, the woman looks a bit uncomfortable. MSs people socializing. 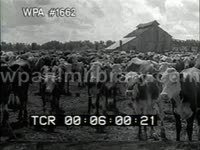 LS people arriving by car. GV parked automobile. GV people joining the party. MS men posing for camera, man holding a drink looks toasted. 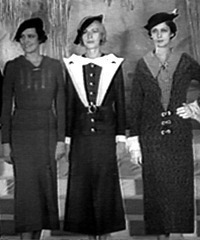 Ladies Board Train United States Three young women in late 1920s-style fashion and dressed in drop-waist, flapper dresses and cloche hats (flapper look) exit a building and smile. They each have short hair (bobs, bobbed hair) and their style is boyish. MS Group of women laugh and smile as they stand on a rail platform in front of a stationary train. Other passengers, all in fine attire and head-hugging hats, wait anxiously for their chance to board the train. Group of women wave from the door of the train to others on the platform. The train pulls away from the station. A group of children laugh amongst themselves as the train drives off. MS Train moving away from the camera. MS Engine of a train travelling toward the camera. A conductor stands in the doorway of the moving train. VS Train moving on the tracks. TLSs intersection of bustling city street showing vehicular, streetcar (cable car) & pedestrian traffic (men & women, Caucasian & African American). City Bustle - Good look at fashion of the 1930's. TLSs bustle of heavy pedestrian traffic (Caucasian men & women) moving along urban sidewalk, a few cars are seen passing in FG, a few street cars (cable cars) are seen passing in BG. 25 Years Ago Today They staged a lavish fur show. 1934's most chic - with the temperature topping 90 degrees in the shade. Women model dresses. Ladies on runway show off glamorous fur coats. One woman's zipper is partly undone, perhaps broken. Fashion.